HP Umpire Mike Estabrook ejected Phillies Pitching Coach Bob McClure for arguing ball calls in the top of the 5th inning of the Padres-Phillies game. With two out and none on, Phillies pitcher Aaron Nola issued back-to-back walks to Padres batters Matt Kemp and Justin Upton. Replays indicate that of the eight called balls to Kemp and Upton, all were officiated properly, the call was correct. At the time of the ejection, the Padres were leading, 3-1. The Phillies ultimately won the contest, 4-3, in 12 innings. This is Mike Estabrook (83)'s fourth ejection of 2015. Mike Estabrook now has 17 points in the UEFL Standings (13 Previous + 2 MLB + 2 Correct Call = 17). Crew Chief Dana DeMuth now has 7 points in Crew Division (6 Previous + 1 Correct Call = 7). 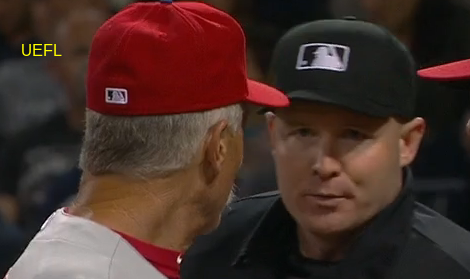 This is the 153rd ejection of the 2015 MLB Regular Season. This is the Phillies' 4th ejection of 2015, T-2nd in the NL East (WAS 6; NYM, PHI 4; ATL; MIA 2). This is Bob McClure's first ejection since April 4, 1989 (Joe Brinkman; QOC = U [Throwing At]). This is Mike Estabrook's first ejection since May 10, 2015 (Derek Shelton; QOC = Y [Check Swing]).